The Local Storage reaction allows you to export segment data to a specific local storage key. This is useful when you want to cache segment data on the device, enabling you to quickly retrieve a CSV list of segments that the user is currently in. If you don’t already have the Local Storage reaction enabled for your project, you’ll need to add it on your Permutive dashboard. The integration will go live in under 20 minutes. 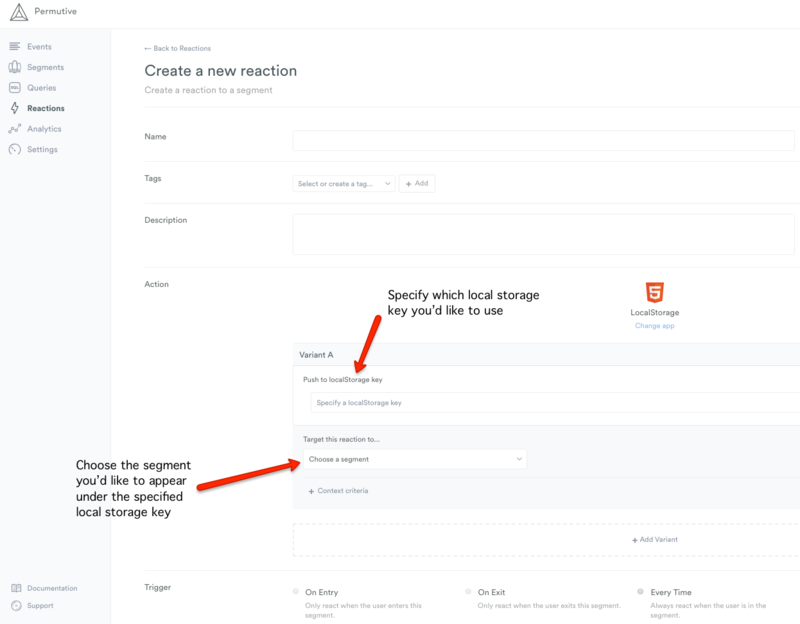 The Local Storage reaction allows you to send any of your Permutive segments directly to a specific local storage key, where you can use them to quickly retrieve a list of segments a user is currently in, under a unique Permutive segment ID. If you have this reaction set up for different segments using the same local storage key, they will be combined as expected. localStorage.getItem("foobar"), you will get [1000, 1001] as the result. You must add a new reaction for each segment you send to local storage.